When one thinks of getting production from second base rarely do the words “Minnesota” and “Twins” come to mind – at least not since the days of Chuck Knoblauch. Over the past few seasons, banjo hitters like Nick Punto, Alexi Casilla, Matt Tolbert, and Luis Castillo have manned the position for the Twins. Last season it was Punto and Casilla teaming up to do the damage, splitting time at the position and posting OPS numbers of .676 and .526 respectively. It was time for a change. Minnesota inked the veteran second baseman to a one-year, $5 million deal this off-season, a small price to pay for such a significant upgrade in talent. Hudson isn’t in the same class as Chase Utley or Ian Kinsler, fantasy-wise. 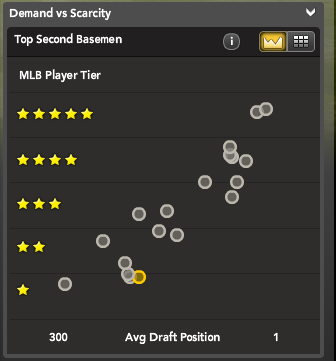 That duo rank as five-star talents in Bloomberg Sports’ Demand vs Scarcity chart, while Hudson earns just one star. Even so, his ability to steadily contribute in a number of categories gives him solid value as a late-round pick. Over the past four seasons Hudson has averaged a slash line of .292/.363/.440 (AVG/OBP/SLG) with 10 home runs, 64 RBI and 66 runs scored, more than respectable for someone ranked 24th at his position. Some of that success can be attributed to playing with the Diamondbacks in hitter-friendly Chase Field for three seasons. But Hudson spent 2009 with the Dodgers, where he posted a home OPS of .807 in Dodger Stadium, a tougher park for hitters. Hudson averaged 31 doubles during that same four-year period. Last season, he rapped .283 with 35 doubles, numbers few second basemen achieve. If you sort the Top 10 second basemen by those two stats you can see that Hudson’s combination of average and doubles ranks among MLB’s leaders. We don’t yet know how Target Field will play, and if the Twins’ new stadium will be friendly to doubles hitters like Hudson. But in an increasingly potent Minnesota lineup, Hudson’s ability to get into scoring position could net some solid runs scored totals. 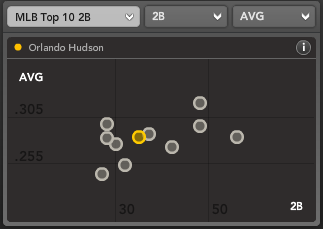 Hudson’s current ADP (Average Draft Position) is 185th, which slots him somewhere in the 15th round in standard 12-team mixed leagues, making him a middle infield target late in your draft. For more information on the top second basemen in baseball, check out Bloomberg Sports’ fantasy kits.